If you are a spectator, please follow players quietly. There is to be no coaching or “advice” given to any tournament participants. “Advice” is defined in the USGA Rulebook under Rule 8 – Advice; Indicating Line of Play as any counsel or suggestion that could influence a player in determining his play, the choice of a club or the method of making a stroke. ​Information on the rules or on matters of public information, such as the position of hazards or the flagstick on the putting green, is not “advice”. Communication with tournament participants should be kept to a minimum. Appropriate reasons to communicate with a participant include giving food, beverages, sunscreen or in the event of a health concern. Please make sure another participant or spectator can see you during this communication. Cell phones are strictly prohibited anywhere on the course except for the clubhouse. Please turn off your cell phones or put them to silent to allow for a distraction free round. Spectators should not involve themselves in any ruling situations at any time, unless asked to do so by an official. 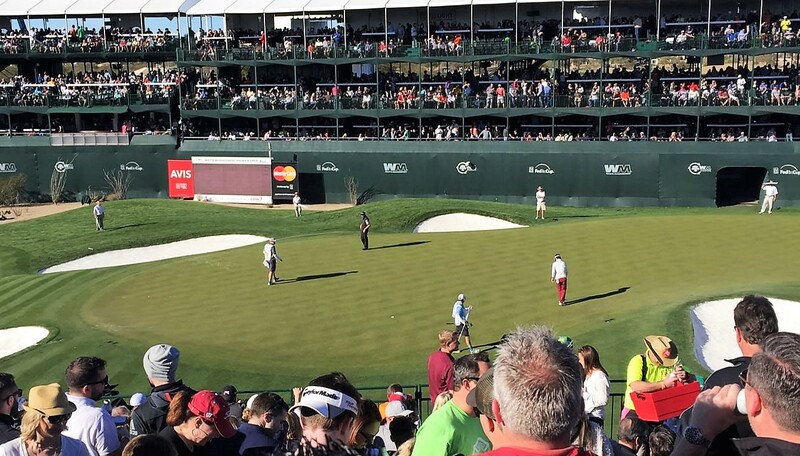 Spectators should stay a minimal of 50 feet away from any ruling being made. If a spectator has a question regarding a ruling, please wait until the participants are back on the course and resume play. If at any point a rules official feels uncomfortable regarding the manner that a spectator is treating them, the spectator will be asked to return to their car or leave the premises of the golf course for the duration of the tournament. Spectators shall never make a ruling for a participant. If the spectator makes the wrong ruling it may disqualify the player or cause him/her strokes in the tournament. This may also breach USGA Rule 8, listed above. If a participant knowingly breaches USGA Rule 8 by asking a spectator for advice, they will be given a 2-stroke penalty. ​Blue jeans, cut off t-shirts, sleeveless shirts, or t-shirts are not considered appropriate golf attire and will not be permitted during tournament play. Hats must be worn with the bill facing forward at all times. ​Tournament participants are not permitted to wear open toed shoes during play (i.e. sandals, flip flops, Birkenstocks). ​If the dress code is not met, the participant will be asked to change. Any club breaking or club throwing is cause for immediate disqualification (DQ). Tour membership may be suspended if the committee sees fit for this action. ​Any purposeful damage to the host facility is cause for immediate disqualification (DQ). Tour membership will be immediately suspended and a hearing will be held by the committee to determine if the membership will be permanently revoked. ​Abusive and offensive language towards self, BJGT staff, volunteers, or spectators is cause for immediate disqualification (DQ). ​Cheating will not be tolerated on the Buckeye Junior Golf Tour. If there is probable cause that a participant intentionally cheated at any time throughout the tournament they will be disqualified (DQ). A hearing will be held by the committee to determine if it is necessary to suspend the participant’s tour membership, if applicable. ​Golf is a game of integrity. When playing in a BJGT event, please represent yourself, tour spectators, and BJGT as ladies and gentlemen of the game. Any consumption, use or participation of the above substances or actions will be cause for immediate disqualification (DQ). A hearing will be held by the committee to determine if it is necessary to suspend the participant’s tour membership, if applicable. ​Any other violation or action that is deemed to be a breach of the code of conduct can be cause for immediate disqualification (DQ) or potential suspension of a tour membership.